This week, millions in the Western world will celebrate an American holiday in the name of thankfulness. This treasured tradition was birthed in the application of spiritual disciplines such as fasting, prayer, and thanksgiving. In 1621, when the Pilgrims landed at Plymouth Rock, they were grateful just to be alive. Not long after, they faced decimation by the inhospitable environment and frigid winter temperatures. The native Wampanoag Indians helped them to acclimate to their new world. After many trials, they survived and celebrated with a three-day feast thanking God for all He had done. Today, in a post-Christian America, Thanksgiving looks much different. Like many other aspects of our culture, the secularization of this once consecrated holiday has descended into a shallow form of itself. It's safe to assume that as a nation, we’ve never been more ungrateful. Consumerism has consumed us, the Internet has desensitized us, and our appetites for godlessness is even bigger than it is for Turkey. Instead of glory, honor, and praise to God for lavishly pouring out grace on His people, the concern has shifted to NFL, food, and Black Friday. Unlike the Pilgrims who were forced to till the ground for physical and spiritual food, modern America has grown fat by being the apathetic benefactors of others' labor. No longer are we a people desperately leaning on God and each other for provision. Instead, we have grown increasingly proud and entitled. A sin that has driven us far from the humble beginnings of the brave men and women whose blood and tears laid the foundations of this great country. No matter how godly a person is, on some level we all think this way. Even the most pious believers still struggle with a deep-rooted pride that results in the self-aggrandizing that deceives us into thinking we are the center of the universe. Before Christ, the world told us that we could be the masters of our lives. This old-school tactic is precisely how the Devil deceived Eve and we still haven’t completely abandoned this notion. We pray to God to use us according to His will but feel slighted when He doesn’t do it our way. Whether your ingratitude manifestation is subtle or overt, the time to tackle it is now. Romans 12:3 For by the grace given to me I say to everyone among you not to think of himself more highly than he ought to think, but to think with sober judgment, each according to the measure of faith that God has assigned. James 1:2-4 Dear brothers and sisters, when troubles of any kind come your way, consider it an opportunity for great joy. 3. You think God hurts you out of anger or condemnation. He is the only one who knows what you truly need. If you’ve prayed, “Lord, make me like Jesus,” He may just be answering your prayer. Lamentations 3:33 For he does not enjoy hurting people or causing them sorrow. 4. You struggle with this life being full of fleshy trials, not perfect happiness. That place is coming. It’s called heaven. By way of great grace, the Holy Spirit will help you realize that your ingratitude can be repented of and used for His glory. A believer’s ungrateful heart is a place God wants to heal, sanctify, & conform. Despite personal failures, rejoice because God is not done with you yet (Philippians 1:6). Though at times you may naturally bend to the low place of ingratitude, you’ve been given the power to choose whether or not to remain there. When confronted with ingratitude, it’s helpful to expand our perspective. It is hard to be ungrateful when we consider the prisoners in North Korean labor camps who are beaten and killed for their faith. Would we dare be so presumptuous to call one of them to complain about the obnoxious co-worker we're choosing avoid? Or would we be so dense to call a friend with a handicapped child to complain about your child’s poor report card? When something rises against our perception of the most ideal circumstances, our flesh begins to hoist the banner of mutiny it has sewn together in the dark places of our hearts. When it does, we must stand and prepare to fight. Too be purposed in choosing gratitude. 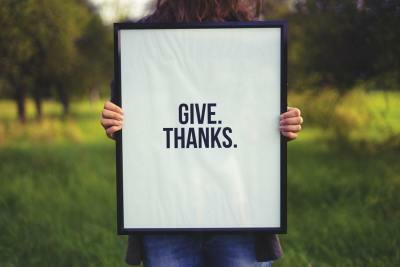 To wield a thankful heart as a weapon against discontentment. After all, to give thanks is the will of God in Christ.